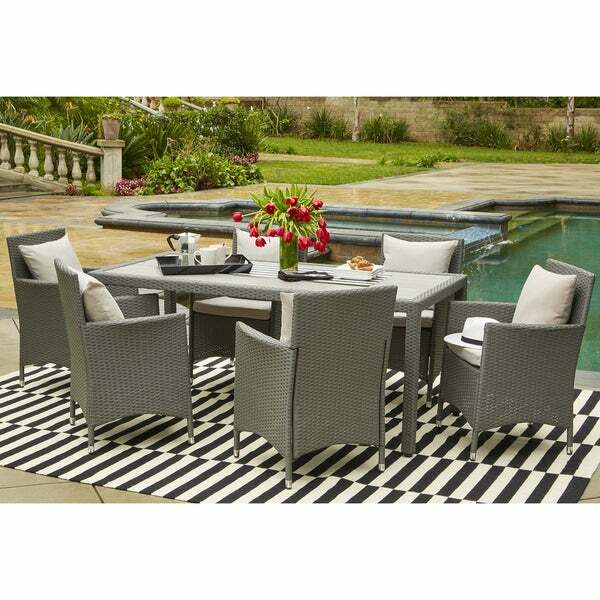 Enjoy a relaxing outdoor dinner on warm summer nights with the 7-piece Stillwater dining set from Havenside Home. Constructed of durable all-weather resin rattan woven over a rust-proof aluminum frame, this modern dining set is built to withstand both weather and wear. 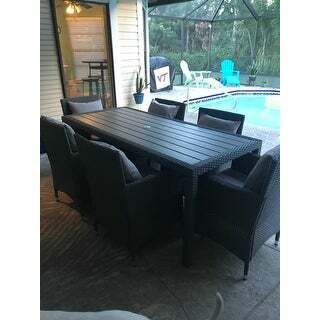 Over two years I purchased the 6 piece sitting set but didn't have room for the matching table set. New house has more space and I was delighted to find the matching table set was available! The chairs are comfortable enough to serve also as extra seating in the conversation area there by not requiring the usual extra not often used chairs. 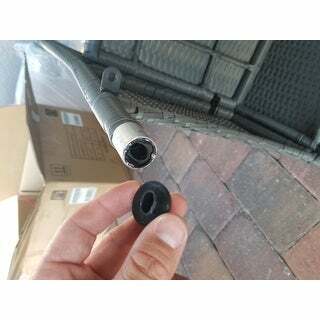 The only reason for 4 stars and not 5 is that 2 of the legs did not go on straight and my husband will need to take the table apart and see if he can straighten the connection where the vertical support rods attach to the table. This is a really pretty set. The chairs are great. They are so comfortable and pretty to look at. I love the color of the grey. It's light grey and matches the grey in my house. My brother is going to build me a patio to put it on. So I will be able to have a great outdoor party next year! 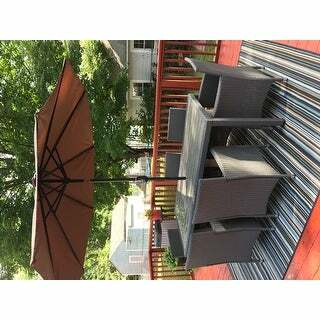 I did LOTS of homework before purchasing this outdoor dining set and this one is brilliant! Not only beautiful but very easy to put together, and I did it myself! All hardware and tools arrived intact and complete. Comfortable chairs that slide under the table easily. Cushions are well constructed and completely dry out quickly (in New England weather too)! Amazing quality for the price! 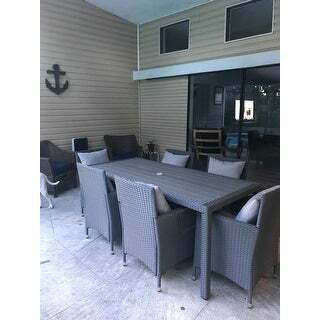 Perfect dining set for our patio. Color is grey, the cushion is not the thickest but for the price we paid we are happy with what we got. I like that they have a place holder for the umbrella. Not all tables have it. Great table and chairs, not too big or small. The top is plastic but looks good, modern, sturdy. Is it the highest quality, no, but I didn’t want to pay highest quality prices! Even if I only get a few years out of this it’s awesome value. I have been enjoying this patio set for the past 2 months. Very lovely and the chairs with the cushions are extremely comfortable, not to mention sturdy. Fairly easy to assemble. Put it together myself in a couple hours. Love the gray color and wood look table rob. Second season with it and it looks great. Cushions are water resistant but I keep them inside when take is not in use or rain is on the way. If I could give this set 0 stars I would! 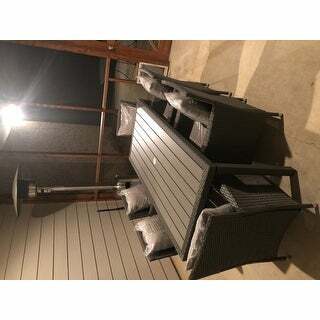 I just bought this set last week for our new home because it was at a more reasonable price for patio furniture and looked nice from the pictures and got mostly good stars. I don't know how, other than most people must have earned money for their good reviews! This set is a total piece of crap! It did arrive in a timely manner and we were so excited to put it together and get to finally use it last night. After 2 hours of frustration trying to put this table and chairs together we are not happy at all with this purchase! For *** we expected a lot better quality. It looks like cheap plastic and none of the parts meet or match up! The resin on the legs does not come all the way up to meet the table and looks very crapy. And the chairs were a total nightmare to put together with one chair being broken on the bottom on arrival and not matching in the middle! 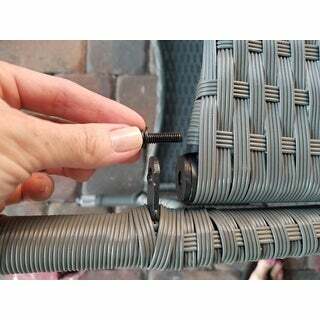 None of the metal matched up to put screws in to attach the bottoms and had to be bent to fit and the metal is cracking on one of the chairs! None of the screws were long enough to fit either! I feel this set will not hold up for very long! This set was not even worth $100! Its sad that a reputable company such as Overstock would sell such a sad piece of *** to customers! 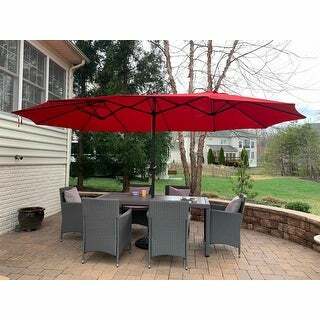 Very nice outdoor dining room set. Came in 4 boxes so you will need help bringing it in. Takes a while to set up but it’s not hard. Wish the table were a little bigger and just note that since the chairs have armrests you have to pull them all the way out to sit down. Overall good piece for a great price. We made this purchase as a replacement to another outdoor table we'd purchased from Overstock - this one is certainly better than the last. The table is compact (but not small - it sits six people comfortably for dinner), and it fitted very well on our back patio. The chairs are fine, although not as sturdy as some of the larger outdoor chairs we've seen. So far it seems to be withstanding the elements well, although we take the cushions in when it is raining. Great quality chairs and water-resistant cushions! The water beads right off the pillows and wiped right off the table. They're really sturdy and not difficult to put together! Great buy for the price! I love the set so far. I do think the tediousness of assembly is the downside. It took over two hours to assemble it - mostly the chairs. But it looks great in my space and since it’s inside my screened in patio it should hold up well. 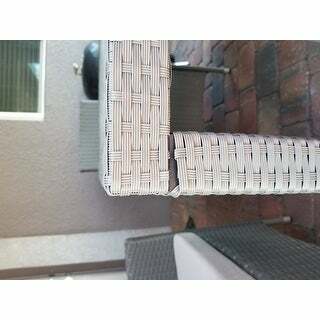 Received our patio set today. Easy to put together. We are so pleased with the set. Very sturdy and made well. Can’t wait to spend many hours sitting at our patio set. Beautiful colors but very delicate rug. This rug is beautiful but very delicate. Not appropriate in homes with kids. It’s perfect size for my needs it’s semi compact but big enough for the fam. It’s super sturdy and very well made. Love the wicker look. 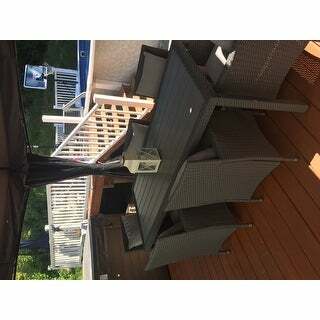 It’s very attractive on my deck and under my canopy. Highly revvomend for medium to small areas or if you want a compact set. Well made and nice looking. Table a little smaller than I was expected but overall sturdy and looks really good! Stayed up in the hot summer of Vegas - I recommend buying a cover as the cushions are light. Love my new patio table. It’s definitely great for small spaces. The table is a bit more narrow than most other tables. The chairs are comfortable and we all fit just fine in them. The color is good. I’ve had it a few weeks now, it sits under my lanai so it doesn’t see or hasn’t seen many elements so far. Since having this new set, I have hosted a few small get togethers and everyone loves it. It’s a good size to eat on, play cards and just hang out. Comfortably fitting. No complaints. "Im looking for instructions on how to wash/dry the cushion covers. Its not on the tag for the cushions. Can you please assist with instructions?" To clean, flush with water, you may want to rinse off the cushions with the hose. When not in use, the cushions and pillows for this outdoor furniture should be placed in a deck box or covered area. This will help to minimize the fading effects of UV exposure and extend the vibrancy of your fabric. "What is the weight capacity of each chair"
"Is the top of the table black or grey. Looks like 2 different colors?" "I did not get direction how to put the furniture"
"Does this set come in black?" No, this set is not available in black. "Are the chair sold separately? I like the chairs but not the table." Unfortunately, the pieces are only sold as a set. "In main picture of set, the table top appears lighter in color, almost cream. In the overhead picture of just the table, it appears dark grey or black. 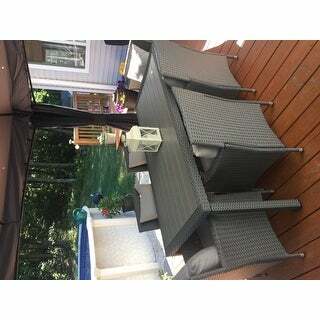 Which table is being sold? Don't see a way to choose between them." The table in this set has the darker trim and the planks are a light color, almost a light grey color.